sheeple just believe everything that comes out of the box! Thing is even if it was asked, all these hoaxers would do is cgi some crap together and say here ya go! "NASA's Historic Three-Billion-Mile Journey to Pluto"
600 Gigabits of data of Pluto to come. Strap yourselves in boys and girls, this ones going to be a rough ride! You know before I got into researching the flat earth it amazed me how crazy people were into space related stuff. From popular forms of entertainment like Star Wars movies, to TV shows like Star Trek, Battle Star Galactica, the list goes on and on. It's all a well organized conglomerated effort to keep you out of touch from reality, to make sure you continue to fantasize and believe what NASA tells you. 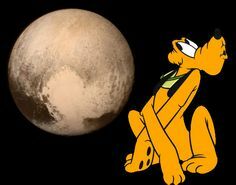 I LMAO-ed so hard when the Pluto the dog silhouette was featured on the latest CG-LIE shot of "Pluto". This thread is friggin' awesome. Stephen Colbert and Neil DeGrasse Tyson discuss Pluto......notice the eye in the circle right behind Neil.......its almost seems like they are making fun of the public by how bold they are with all this NASA stuff. Haha, only the first 10 seconds and last 10 seconds are actually the Sun. The rest is terrible CGI. They're really just having a laugh at this point bruv. And btw NASA, you ain't my bruv, bruv. 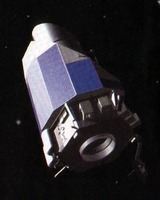 Does Tyson remain "meh" regarding Pluto so as to add a possible layer of seeming-legitimacy to his role as a scientist? He's very skeptical of the fact that Pluto should be a planet, which would make one believe he's genuine, but that's more than likely "a work" to make him appear balanced. 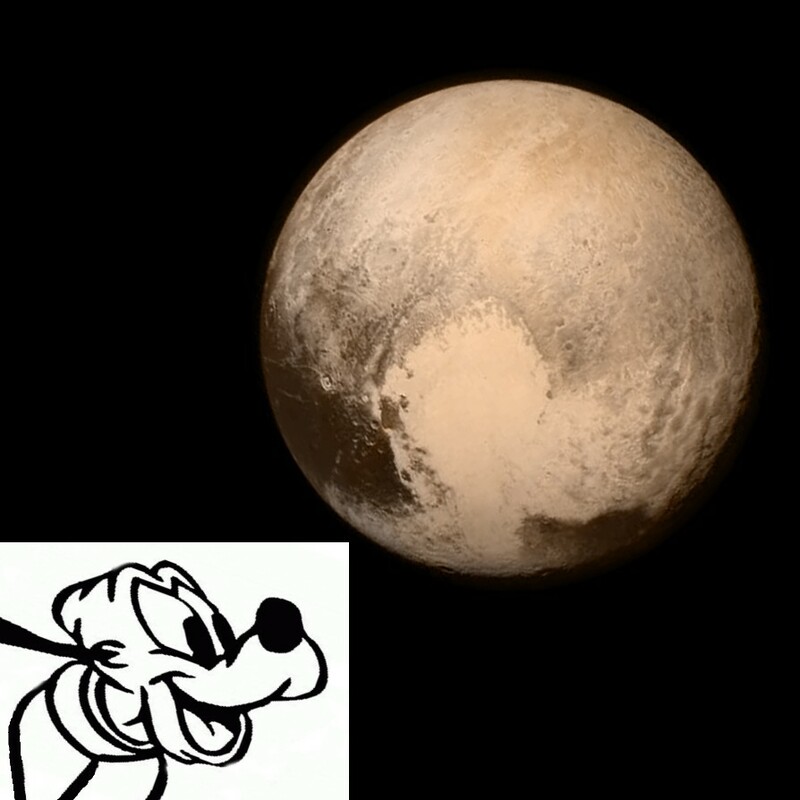 Also, you have to love how NASA can get all the "photos" of other "planets", but it's taken them this long to come up with one for Pluto. Perhaps that's part of it; the length of time that's passed adds to the illusion that they're really "out there" exploring "space"? There is so much wrong in that above video, I don't even know where to start. The eye is a dead giveaway for me. Supposedly an 11 year old girl is responsible for the naming of Pluto in 1930. Is it a stretch to think that that the freemasons at NASA are showing us the "underworld"? Can they have such a big event without throwing a little symbology in for good measure? Charon - Ferryman of the underworld. Nix/Nyx - Goddess is the personification of night, found in the shadows of the world, also mother of Charon. Hydra - The many headed serpent like creature guards the entrance to the underworld. Kerberos/Cerberus - 3 headed hound prevents escape from the underworld. Styx - The boundary of the underworld. How about the part in the middle where NGT is talking about seeing something for the first and Colbert chimes in saying "no ones ever seen a newborn baby chick" before, then they proceed to laugh nervously. 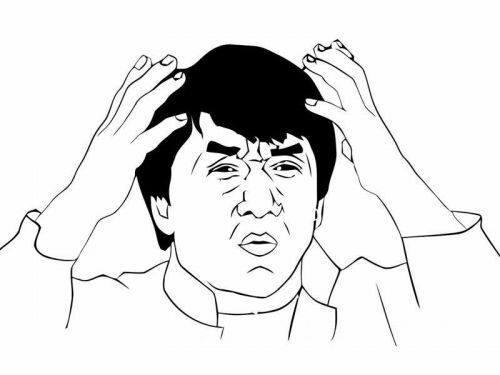 WTF is he talking about, well then NGT has a "shutup stupid" look on his face. 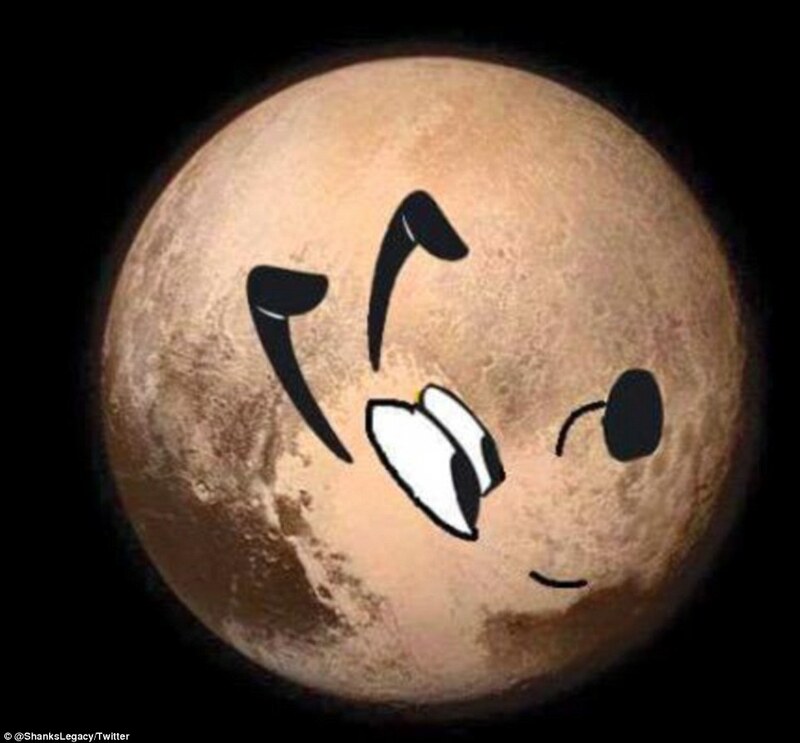 Now that I look at it it's possible they took one of Math's cut outs and used a baby chick then cropped a Pluto the dog silouhette in and voila! Good observations all! NGT isn't the smoothest, especially when he's in a debate, he can barely fumble words out! I don't know what's funnier, the image or how many people in the comments believe it. 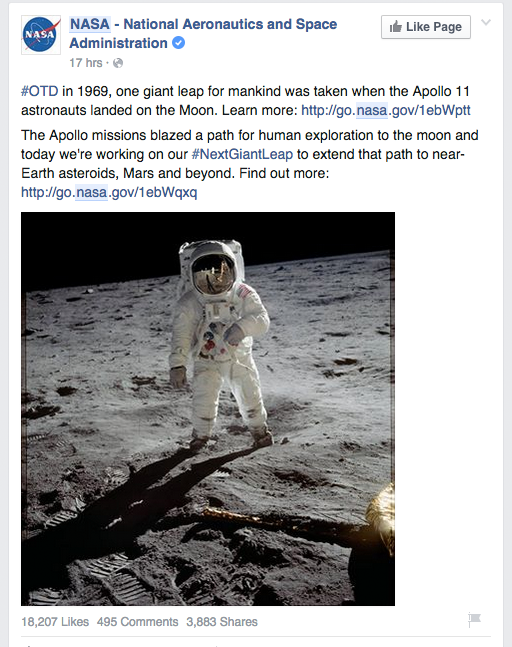 ^That one's right up there with this massive anniversary picture of Buzz on the moon on FB (saw yesterday), with tons of people liking, sharing, commenting, telling of memories...and not a single person mentioning how there's two light sources sending shadows in two different directions, lol. I'll have to find it and get a screen shot. This is a picture I found just after I started to research the flat earth. It is allegedly taken from the ISS. Yes, this image is patently absurd and pathetic, and an obvious fake. They get the curve affect through the use of a fish-eye lens. I signed onto my computer just now to Yahoo's home page and this is the first thing I see. I couldn't stop laughing! I had to take a screen capture and share it here. LMAO! 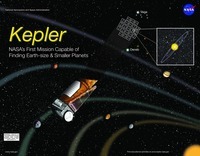 LOL...did they make the Kepler craft out of a can of peas? I thought that space shuttles "glide" in for landings. Sure sounds to me like jet engines flying by and then winding down on touch down. Can someone explain?